This classic businessman's umbrella looks and functions just like a regular umbrella. But this capable self-defense tool hides a deadly secret. Simply unscrew the handle and pull to unveil a 14" stainless steel blade - a menacing deterrent to would-be attackers and an effective weapon, should you be forced to use it. 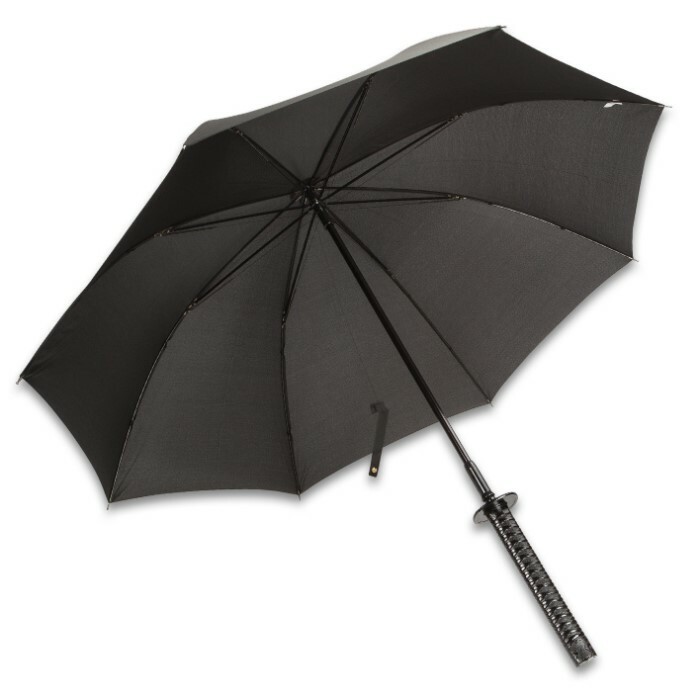 Rain or shine, never leave home without this trusty protector! Handle broke in half on day one. Pieced it back together and just a few days later the umbrella shaft came unglued from threaded portion. I like the idea of the hidden sword but like others it's really just a spike theres no edge at all and it should be up dated to a release button it takes to long to unscrew in an emergency , and as far as the umbrella goes i don't want to be in a real down pour with any wind it has no way to lock in place . I finally had to buy one of these, just to have a sword umbrella, even though I realized it would likely be impractical as either an umbrella or a sword. As an umbrella it is actually very nice, with a 40 inch nylon shell, and good metal ribs (making it 41" rib tip to rib tip) It is 37" flat to flat, quite large enough for two people to walk together underneath. 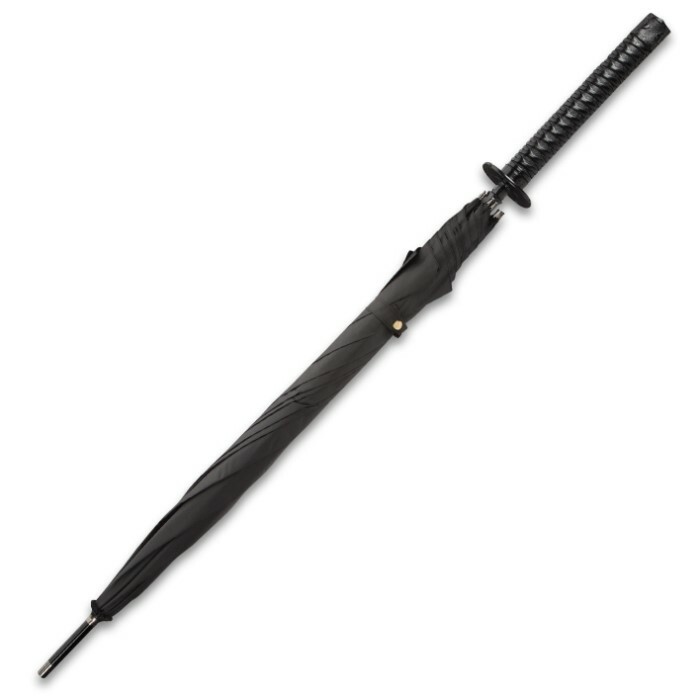 In fact with the 10 1/2 inch molded black plastic Samurai style handle, it makes a perfect umbrella for two people, though at least in my state, one of them would have to have a concealed carry permit to make it legal. The eight, 3-inch, almost invisibly thin springs on the rib supports allow easy open and close. It really seems like a well designed, well made umbrella. The shaft and tip are metal, with a strong glossy smooth layer of pain that I scratched through only with difficulty to prove they are not plastic, as they do not stick to a magnet. The tube shaft is over 28 inches deep, and totally hollow, so the potential of adding a much longer blade, and perhaps even borrowing the handle from an ordinary umbrella is intriguing. Then you would have a REAL concealed sword umbrella, whose only fault would then be the need to still unscrew the blade 4 1/2 full turns, which makes a quick draw totally impossible. 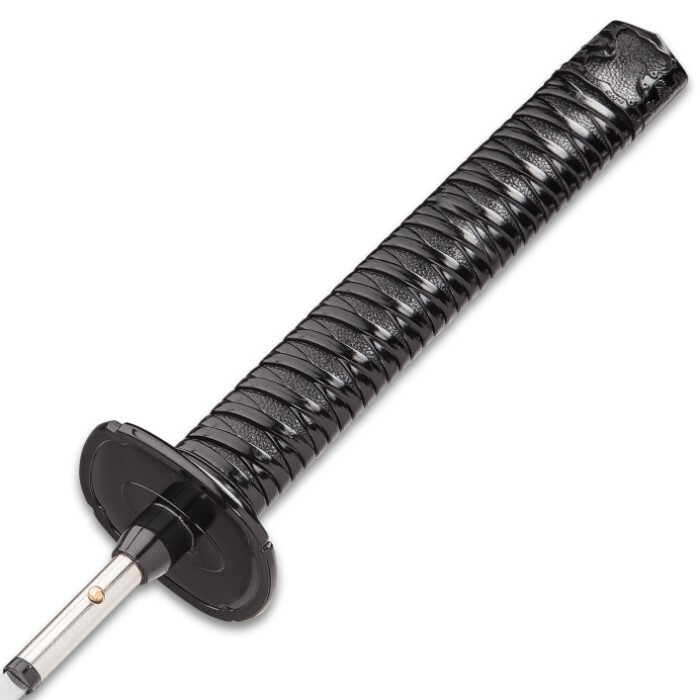 The molded plastic handle, with its molded-in-place 2 1/2 inch tsuba style guard seem cheap, but are made of solid heavy plastic, giving this sword (without the umbrella part) a balance point two inches BEHIND the guard, which is, of course, unheard of. In fact, in its umbrella, while using the shoulder strap across the back in the correct Anime/ninja carry position, it is constantly trying to slip toward a handle down direction, and requires you to keep one hand on the strap at all times, making it decidedly more difficult to leap from roof to roof (but hey, no one ever said the life of an ninja was EASY!) In the umbrella, it is an impressive 40 inches. But sadly the blade is an anemic 15 inches, very dull, and, using my handy magnet, has an estimated 1 inch tang, so hardly likely to cut through armor. However it IS stainless steel, and could be sharpened, or as i mentioned before, replaced if you are a "do it yourself" type. It DOES have a sharp point, and I would certainly run away if faced with it, even if it was wielded by a a female midget with buck teeth, maybe ESPECIALLY if it was wielded by a a female midget with buck teeth though in a pinch I do suspect that she might actually have a more formidable weapon by leaving it in the umbrella as a 40 inch long Katana-handled metal weapon. Judging by their reactions, I think It really does make my neighbors a little uncomfortable when I carry it across my back, with the big Katana handle projecting over my shoulder, with my hand on the strap up by my shoulder, as though I am about to draw (they don't know I have to keep it there for balance) and they seem most especially nervous when I am scrambling across their roof tops, howling (most ninjas are WAY too quiet). Overall, I am quite happy I bought it. The neighbors, maybe not so happy. Happy with the Sword and Umbrella but it didn't come with the sling on the cover to put on your shoulder like in the picture. I wish it had come with the sling. 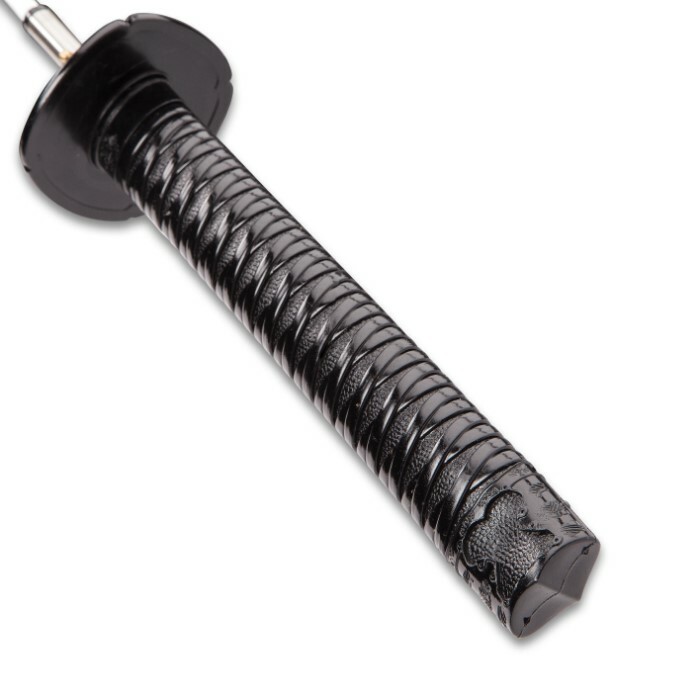 I'm waiting to hear back from customer service if they will ship me the umbrella cover with the sling/strap. It's not noted in the description that it doesn't come with it. I like the sword and had it engraved. I hope I can get a cover with the strap. The sword was as dull as can be. It couldn't even go through cardboard. I like the product, but I would have more luck trying to cut something with a butter knife. I am pleased with this product, with a few exceptions. First, the miniature sword takes several seconds to un-screw from the umbrella. ("Just hold on here Mr. Mugger, I've got to take apart my umbrella...just a few more seconds...") And secondly, the guard on the sword is as crooked as the letter "c". With these exceptions, this product is satisfying. A real decent umbrella. A great replacement for my other long umbrella. Plus you you have the hidden blade just in case you're ever in a serious tight jam. Hopefully I will never need to use it. It's worth the purchase. It's a very nice umbrella, actually. The sword came out of the box very dull. It scratches against the sides of the 'sheath' when I unscrew it and it makes this high pitched squeaking sound. Mostly for display, would take too long to get out if I ever actually needed it for self defense, but still a nice umbrella and feel pretty cool to carry around. 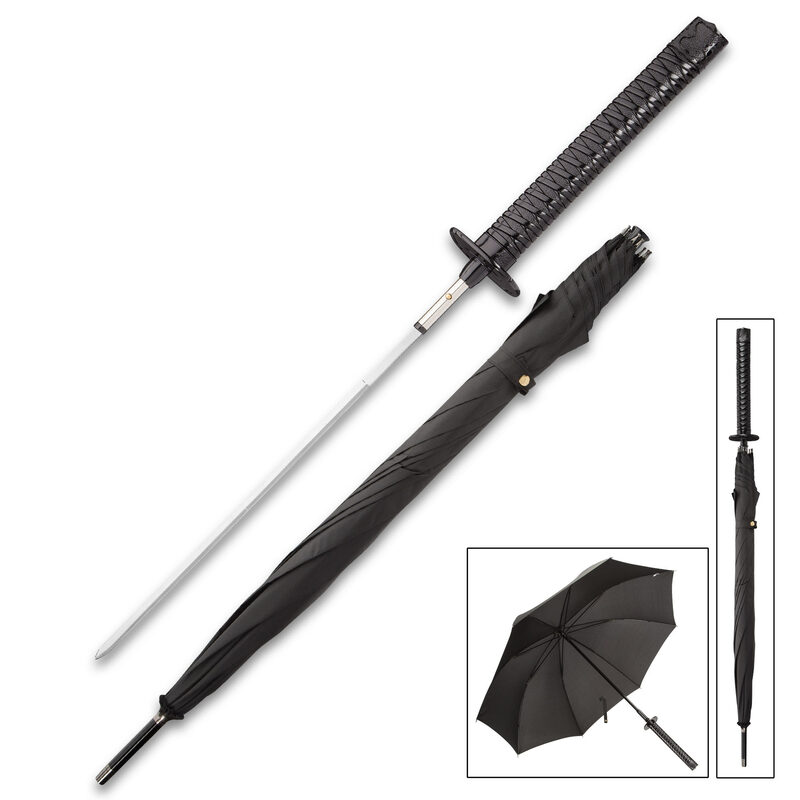 This very well made umbrella is mated with a 15 1/4" 'skewer', not a sword per se. And that is better because if you needed to deploy it, you're not going to be slicing but jabbing up under the sternum or chin of a dangerous attacker. Twirl the well balanced umbrella counter clockwise 5X and the weapon is at the 'ready'. The first thing I did was to nip off the molded hilt on the beautiful handle so as not to 'advertise' this 'concealed weapon' to any alert local constabulary. A pity as it serves as a comfortable, naturally positioned rest. Still can't believe this umbrella is only 13 bucks; going to order 3 or 4 more for gifts and backup.